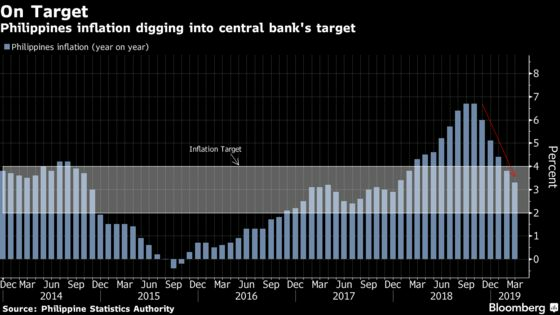 (Bloomberg) -- Consumer-price growth at its slowest in 15 months in March may not be enough to prompt early monetary easing in the Philippines as policy makers take a cautious stance, according to analysts. The comments come as Bangko Sentral ng Pilipinas Deputy Governor Diwa Guinigundo hours before the inflation data release said they will consider easing monetary policy only when inflation averages near the mid-point of a 2 to 4 percent target. Policy makers, which have kept the key rate steady at 4.75 percent since December, will next meet to decide monetary settings on May 9. Effects of the El Niño dry spell on food and utility costs pose upside price risks, said Eugenia Victorino, head for Asia strategy at Skandinaviska Enskilda Banken AB in Singapore. “Even so, the softening momentum in domestic demand and rising risks in export outlook may open the space for the BSP to cut policy rate by 25 basis points in the third quarter, followed by another 25 basis points in the fourth quarter,” she said. A decrease in required reserves ratio may come as early as June, said Emilio Neri Jr., economist at Bank of Philippine Islands in Manila. While slowing inflation brings BSP closer to any easing plans, BSP “will want to see next round of numbers from all indicators to make any moves,” said Robert Dan Roces, chief economist at Security Bank Corp. in Manila.